The Educational Specialist (EdS) program in school psychology is a three-year program with two years of coursework on campus and a yearlong internship. In the EdS Program, students typically earn a Master of Science (MS) Degree after the first year of coursework. The EdS program is fully approved by the National Association of School Psychologists (NASP) and the National Council for Accreditation in Teacher Education (NCATE). Graduates of the EdS program are eligible for certification as a school psychologist in the state of Kentucky and should meet certification standards in most other states. Program completion also partially fulfills requirements for certification as a Psychological Associate by the Kentucky Board of Psychology. States have unique certification requirements and offer job opportunities for school psychologists. A full description of the requirements for the EdS in School Psychology are fully described in the program handbook. The specialist program in school psychology includes a two-year course of study with a year-long internship. Time to degree completion varies (see program outcome data). Applicants who have earned bachelor’s or master’s are considered for the program. The specialist program is designed to prepare professional psychologists with educational expertise who can function in a variety of diverse, educationally-related settings. 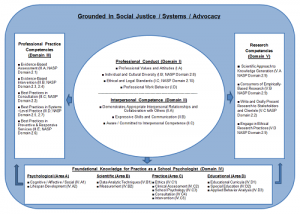 The program’s training model and philosophy espouse commitments to (a) diversity and social justice, (b) evidence-based practice, and (c) school-based practice. These views foster the conception of the school psychologist as broadly capable of conducting research and practicing effectively with clients, in addition to considering the ecological complexity in which the child exists. The assessment of children and adolescents as well as planning for interventions necessitates this broader conceptualization of childhood problems. The program integrates social justice perspectives throughout its training sequence and focuses on evidence-based practices in working with school-aged youth. The program emphasizes a balance between psychological and educational theory as well as applied practice. Our training model, pictured graphically here, consists of five domains that are interrelated and fully grounded in: (a) a commitment to social justice, (b) understanding that various systems affect children’s functioning (e.g., home; school; community), and (c) an advocacy role for psychologists working on behalf of children. Professional Conduct (Domain I) and Interpersonal Competence (Domain II) are emphasized as core components of professional training that impact learning and practice related to professional practice, research competencies, and mastery of foundational knowledge. Within Domain I, the Program training model emphasizes the critical roles of developing a professional identity as a psychologist and a lifelong learner, understanding diversity, behaving ethically, exhibiting self-care, and committing to professional work behavior. 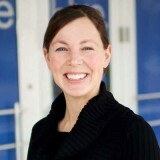 Within Domain II, the Program training model emphasizes the goal to develop students’ interpersonal competence through fostering empathic behavior, engaging in appropriate interpersonal relationships, communicating effectively with others across various settings, and building awareness and commitment to interpersonal competence throughout students’ professional development. The arrows extending from the core reflect Program faculty and students’ beliefs that professional conduct and interpersonal competence impact all other aspects of professional training. Within Domain III (Professional Practice Competencies), the Program training model reflects a commitment to training students in delivery of professional services with strong evidentiary base. Within Domain III, the Program training model reflects its deep commitment to the scientist-practitioner model within respect to professional practice. Program training emphasizes evidence-based practices in four core professional activities: (a) assessment, (b) intervention, (c) consultation, and (d) supervision. Within Domain IV (Foundational Knowledge), the Program training model identifies foundational content that is critical for both professional practice and research. The placement of Domain IV at the base of the training model reflects the Program’s belief that science and practice must be grounded in understanding psychological, scientific, practice, and educational foundations and methods of professional psychology. As the arrows indicate, the training model emphasizes that mastery of foundational knowledge undergirds training in both the science and practice of psychology. Within Domain V (Research Competencies), the Program training model identifies the Program’s commitment to sound research training of its students. to provide data for the faculty as to whether the training students receive in the specialist program is effective in achieving these competencies and to use this information as formative feedback for program monitoring and continual improvement. The EdS program handbook provides a complete description of all program goals, objectives, and competencies, and student evaluation measures. Program documents and forms are linked on the right of this page. The EdS program handbook describes the provides the written program policies, procedures, and institution requirements for degree completion. Expectations regarding students’ performance, continuance in the program, and procedures for the termination of students are also outlined in the student handbook. Students receive feedback on the extent to which they are meeting the program’s requirements and performance expectations via multiple modes of assessment.